A delay in immune reconstitution after cord blood transplant for leukemia can lead to patients developing potentially life-threatening CMV infections. McGoldrick et al. used a sensitive assay to detect CMV-specific CD8+ T cells in patients after transplant. Patient fibroblasts were isolated and infected with CMV. After 48 hours, CD8+ T cells from patients were isolated and incubated with the infected fibroblasts. CMV-specific T cells will proliferate in response to antigen, and can be selected by expression of IFNγ. CMV-specific T cells are present and functional after transplant, but fail to expand in sufficient numbers to control CMV infection. Hematopoietic stem cell transplantation is used to treat patients with a variety of hematologic malignancies. The use of umbilical cord blood transplant (UCBT) has increased as a source for stem cells due to availability and less stringent matching requirements for donors and recipients. However, there is a higher risk of non-relapse mortality for UCBT compared to other sources of hematopoietic stem cells due to delayed recovery of the immune system relative to other transplant methods. Cytomegalovirus (CMV) infects 50 to 80% of adults in the United States, and like other herpesviruses persists as a life-long latent infection controlled by T cells in healthy individuals. Around 10-fold fewer T cells are transferred with UCBT compared to when peripheral blood stem cells are used, and these T-cells are naïve with no prior exposure to antigens. Without T cell protection in transplant patients, CMV can reactivate and result in mild to life-threatening multi-organ disease. Antiviral drug therapy is required for patients to prevent and treat CMV reactivation while the immune system recovers. Previous research reported that CMV-specific CD8+ T cells were only reliably detected 100 days after transplant, after the transplanted T cells had time to mature in the thymus. Drs. Suzanne McGoldrick, Colleen Delaney, Stan Riddell and colleagues in the Clinical Research Division used a more sensitive assay to assess the reconstitution of T cell immunity to CMV infection after UCBT. Using this method, the researchers were able to detect low frequency T cell responses, and characterize the stability of responses over time in patients. T cells were isolated from 15 CMV seropositive and four seronegative transplant patients at various days post transplant and incubated with patient-matched CMV-infected fibroblasts. Infected cells display viral antigens on their surface through major histocompatibility (MHC) receptors, which are recognized by T cell receptors. CMV can evade host detection by downregulating the expression of MHC receptors. For each UCBT patient, fibroblast cell lines were generated and infected with the RV798 strain of CMV, which lacks the genes that down-regulate the MHC receptor. 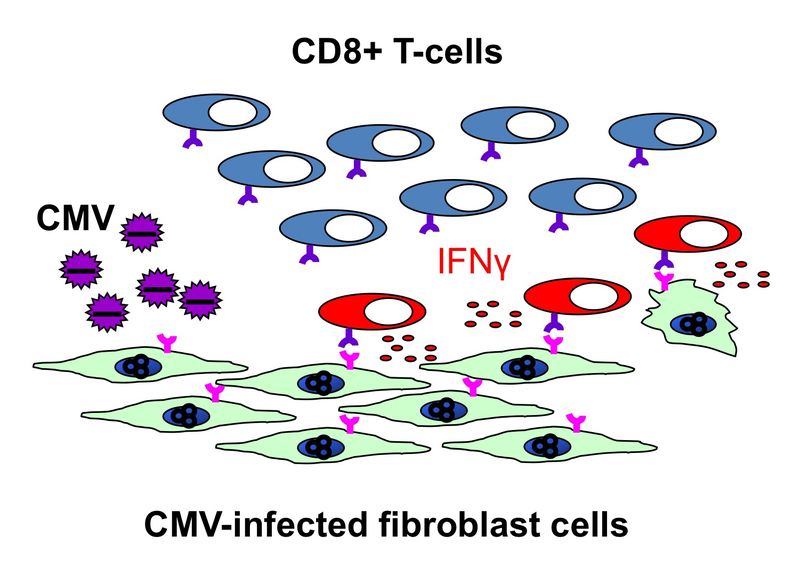 CD8+ T cells that recognize CMV antigens proliferate, and express and secrete IFNγ to kill infected cells. Activated CMV-specific CD8+ T cells were detected by intracellular staining of IFNγ (see figure). CMV-specific CD8+ T cells were detected in 11 of 15 of the CMV seropositive patients between days 42 and 56, and in two more patients by day 80. While CMV-specific T cells were primed early, absolute numbers of T cells were low in patients and failed to control infection; 13 of the 15 CMV seropositive patients had virus reactivation and needed antiviral therapy. These early T cells were capable of recognizing multiple CMV antigens, so the failure to control infection was probably not due to limited antigen detection. The researchers then began to address why the CMV-specific CD8+ T cell population size remained low during the first several months after UCBT. Patient derived T cells proliferated and remained viable in vitro when exposed to CMV infected cells, suggesting that the cells were not inherently defective in cell growth or survival. Using another sensitive assay, the researchers found that CMV-specific CD4+ T cells were also present early, but the population was also small in patients. CD4+ T cells regulate the function of CD8+ T cells, and can contribute to low CD8+ T cell numbers in patients. Alternatively, the use of immunosuppressive drugs or other environmental factors in patients could block T cell expansion. Preliminary studies showed fewer CMV-specific CD8+ T cells were recovered from fibroblast co-culture in the presence of immunosuppressive drugs. Further supporting this mechanism, viral control coincided with increased T cell numbers and immunosuppressive drug reduction in patients. According to Dr. McGoldrick, "Our research demonstrates that T cells developing after cord blood transplant are capable of recognizing cytomegalovirus, but are unable to accumulate to sufficient numbers to control the virus. This finding suggests that immunotherapy with virus-specific T cells expanded from the patients blood could be used to treat this complication." This could decrease the need for long-term antiviral drugs in transplant patients. McGoldrick SM, Bleakley ME, Guerrero A, Turtle CJ, Yamamoto TN, Pereira SE, Delaney CS, Riddell SR. 2013. Cytomegalovirus-specific T cells are primed early after cord blood transplant but fail to control virus in vivo. Blood. Epub ahead of print, doi: 10.1182/blood-2012-09-453720.